We made this with red onions as we had no Spanish onions to hand which worked well; if you have the Spanish onions it works even better! Heat the butter in a large pan until foaming. Add 2 tbsp of the olive oil and the onions and cook on a fairly low heat until soft and golden, about 30 minutes. When the onions have softened, stir in the garlic and thyme and set aside. Heat the oven to 200C/180 fan/gas 6. Bring a large pan of salted water to the boil, add the potatoes and boil for 5 minutes, then drain well. Mix the potatoes with the rest of the oil and some seasoning in a large roasting tin. Roast for 30 minutes, tossing halfway, until golden. Stir in the onion mixture and roast for a further 10 minutes. Just wondering, what makes these guys Lyonnaise? 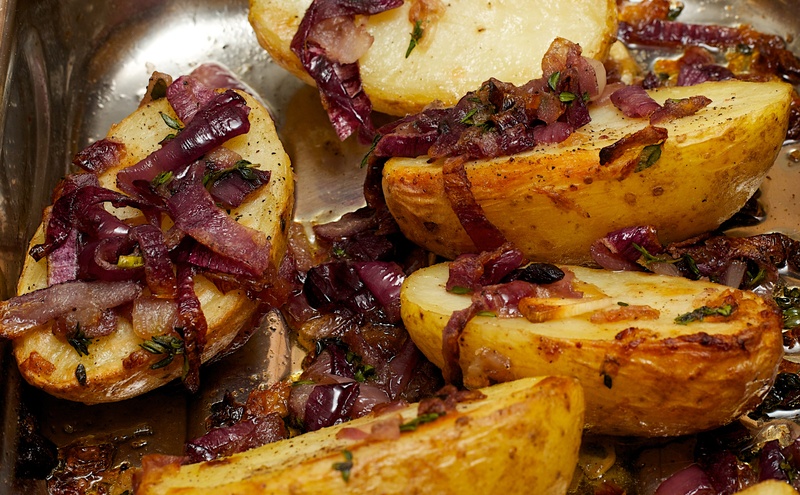 ‘Lyonnaise’ means sautéed with onions.